As you know by now, the annual 4/20 cannabis smoke-out is fast approaching. For several years, thousands from all over the Metro Area have gathered on CU’s Norlin Quad to toke up at precisely 4:20pm. After an afternoon of low-key festivities a cloud of smoke rises above the Quad to cheers from participants and onlookers. Soon after, the crowd disperses, volunteer crews clear the field of trash and by the next morning it’s impossible to tell anything involving such a large mass of humanity has occurred. To my knowledge there has never been violence, vandalism or a significant injury during the event. Normally the police stand around the perimeter, obviously relaxed and bemused, occasionally issuing tickets to partiers who inadvertently light up under officers’ noses. The biggest criticism one might level against the confab is that despite being a rather defiant gesture in the face of one of the longest and cruelest of America’s seeming endless litany of failed wars, the event has remained remarkably non-political. Unfortunately, 4/20’s aura of smoke mediated tranquility will dramatically change. In a vainglorious attempt to protect its costly commercial branding scheme, the CU administration plans to crack down on 4/20. They want to “put an end” to the gathering, which apparently has impeded the administration’s desire to present an unblemished corporate image to wealthy donors and upper class alumni. 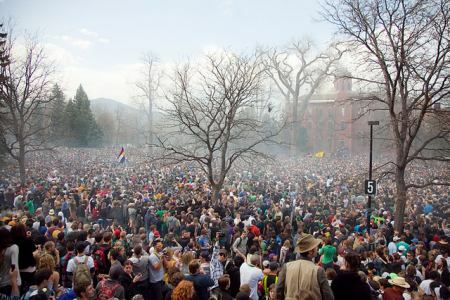 The effort to repress 4/20 began last year with publicized administration complaints about alleged “disruption” and the “cost” of managing the crowds. The administration’s public cost claims were riddled with double counting and bogus numbers and the disruption no worse than a Friday afternoon football game. Now, initiating an ill-considered policy shift the CU administration will shell out hundreds of thousands of dollars to convert campus into a garrison state, complete with armored perimeters, hire a pot-loving hip hop artist in Coors Events Center to distract students gullible enough to fall for the ruse, and mobilize hundreds of police to wage war against pot smokers. Incredibly, in an ultimate display of condescension and disrespect, the CU administration plans to lock students inside the Coors Center during the concert. A demeaning email was sent to CU students ordering them stay away from the Quad, which will be closed off and surrounded by armed police, and not invite their friends to campus. The email signed by CU administrators and a sadly complicit student government tri-executive threatens to publicly out, on a CU website, any students caught in the act so that their expensive and hard-won bachelors degrees might be compromised in a depressed labor market. Aside from blackmailing students and militarizing the campus, the CU administration plan represents an elitist attack on young people, whose welfare the University is entrusted to protect. Several hundred police will be pitted against thousands who in past years have peacefully assembled on the CU campus with virtually no untoward consequences. Given that the CU action will involve the application of significant police power against so many people, the potential for an incident, a miscalculation, a mistake, a spark, seems rather high. Images of smoke, not from pot, but from teargas canisters amidst running battles across campus are easy to conjure. Apparently, the risk of violent confrontation is something this CU administration is gladly willing to take in its reckless zeal to protect its “brand.” As a staffer whose job is to ensure students’ success, I find the administration’s plan not only grossly immoral and embarrassing, but extremely irresponsible and dangerous.